Although this is not the primary focus of our business, we are extremely accomplished at it. 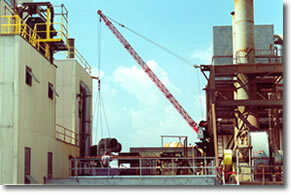 When others say something can't be moved or done with rigging, that's when Seneca Steel is generally called in. We have an assortment of lifting beams to suit most needs. We have chokers, shackles and virtually any machine or device that might be needed to accomplish a difficult rigging task. Of course the most critical element is the experienced personnel on staff that can solve the difficult problems. Here is an example of a Seneca solution to a difficult rigging situation. Click here to see the story on it.